I can’t write enough about how much I love Eeboo. Their marvelous products are designed in a soft color palette that is easy on parental eyes and tons of fun for babes. 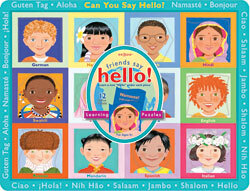 What’s cooler than seeing your toddler say hello in 12 different languages while playing with the Friends Say Hello! Puzzle ? Multicultural education is a bargain at $7.95.